In 2010, inspired by the success of the mockup tool Balsamiq, I started working on a competitor called jMockups. My original goal was basically to build a Balsamiq clone, but instead of it being downloadable software it would be web-based. I named it after jQuery. After a while I realized that competing head-on with Balsamiq was a bad idea so I pivoted to building a high fidelity mockup tool – one that would create mockups that looked like real websites instead of sketches – and I renamed the project Lean Designs. Instead of competing with Balsamiq, I’d be competing with tools like Photoshop that a lot of designers use to design sites before building them. And as an added bonus, Lean Designs would also export your high fidelity mockup to HTML and CSS, saving you from having to manually code up the design when you were finished. I was pretty excited by it. As you might have guessed from the title of this post, things did not go well. I never wound up writing about what went wrong – mostly out of embarrassment – but reading about my mistakes might save of some of you some heartache with your own projects. First and foremost, Lean Designs didn’t solve a clear pain point for a specific group of users. If you had asked me back then who Lean Designs’s audience was, I would have said something like: it’s for developers who want to design a website without writing HTML/CSS, it’s for designers to create a high fidelity mockup of their websites before coding it, and it’s for everyday people who want to create a simple static website but don’t want to code 😱. These are three very different usecases and Lean Designs didn’t solve any of them well. For example, for developers and everyday people who want to create a website, having a What You See Is What You Get (WYSIWYG) web design tool where every element is absolutely positioned makes it extremely hard to create a well-designed site. I touted on Lean Designs’s homepage how easy it was to create beautiful websites with it, but almost everything created with it looked terrible. If you asked me which of those use cases was my focus, I probably would have said Lean Designs was a Photoshop replacement for designers to create high fidelity website mockups. But… I am not a designer. And I’ve never used Photoshop to create high fidelity mockups. I read online about how many designers use it, but I had no expertise in the problem I was trying to solve. And if Lean Designs was truly for designers to create high fidelity mockups, why did I build an export to HTML/CSS feature that would never be used by these designers in a production website? One way to mitigate this is to do customer development: to get on the phone and meet face to face with people in this market to learn about their real problems. I never spoke with anyone in Lean Designs’s target audience to verify my assumptions. This is ironic given that Lean Designs is named after the Lean Startup movement, a big part of which is to do customer development to avoid making incorrect assumptions. I also didn’t research any of my competitors. I rationalized it by saying to myself that I didn’t want to be influenced by what was currently on the market. To this day I’m still learning about competitors that existed back then that I had no idea about. I formed jMockups LLC to add an element of seriousness to the project even before the site had launched. That’s $500/year to operate in Massachusettes. With all of these administrative things taken care of, I proceeded to spend months building the first version of the product. I thought I was being innovate by blindly following my vision for the product, but I was being extremely naive. When I received feedback about jMockups on HackerNews, I took every bit of praise as validation that the product was on the right track. Same thing when I announced the pivot to Lean Designs. The first version was completely free. I wanted feedback – any feedback – and thought that the best way to do that was to get as many people using it as possible. Feedback from free users can be very misleading; what you really need is feedback from people who will pay. Eventually I transitioned to a freemium model where you could create a limited number of mockups for free or unlimited for $9 per month. This was a tool that I was aiming at professionals and I charged the same amount as a burrito at Chipotle. The only marketing I did for it was to create a blog where I only posted about feature updates. I should have been writing – or paying someone to write – content that would be interesting to my target audience (whoever that was). And for the few people that did use it and did pay, I eagerly implemented almost every feature request in the hope that each one would turn the tide on my failing product. I was in a mastermind group at the time, but we spent too much time talking about features and not whether the Lean Designs was viable in the first place. I didn’t pay close attention to metrics nor did I look at what people were actually creating with the site. Finally, I spent way too much time trying to turn what I knew to be a flop into a successful startup. It’s hard to know sometimes whether an idea is bad or whether you just need to keep pushing, but in Lean Design’s case I kept at it way too long. After about a year and a half and hundreds of hours spend toiling away on nights and weekends, I stopped accepting new users, put up a notice that it would be shut down in a few months, then killed it. The upside of my experience with Lean Designs is that I picked up a lot of new technical skills and learned a lot about what not to do which I later applied to Lean Domain Search and other side projects. Was it worth it? Could I have learned these things by reading blog posts like this one when I was deciding whether to work on Lean Designs? It’s hard to say. I’d like to think so. Maybe some things just have to be learned the hard way. On that note, if anyone reading finds themselves working on a project with similar issues and is looking for feedback, don’t hesitate to drop me an email. Hey everyone, I just changed my Twitter name from @leandesigns to @mhmazur. If you were following @leandesigns, it should have automatically updated for you. I originally set up the @leandesigns account after I renamed jMockups to Lean Designs, but never really found the right balance between using it for marketing and using it for personal use. I’m not much of a Twitterer (? ), but saying Hi to friends from a company’s Twitter account seemed awkward. I probably should have used it more to engage with folks looking for a web design tool, but that always seemed too spammy (which is probably wrong). Anyway, I think I’ll use it more now that it’s just a personal account. Feel free to say hi @mhmazur. Yesterday I launched Lean Domain Search, a new domain search engine, on HackerNews. You can read the discussion here: Review my Startup – Lean Domain Search – The fastest way to find a domain name. Lean Domain Search is a follow up to Domain Pigeon, my first Rails project which I launched (also on HackerNews) a little less than three years ago. Lean Domain Search is what Domain Pigeon was supposed to be: you type in a search phrase and the app pairs it with other words to generate domain names and instantly shows you which are available. I even kept a notebook in my car and when I saw a company name that started or ending with something that would also work for a domain name, I’d jot it down. One problem though: I didn’t know how to do it. It’s not hard to programatically check whether a domain name is available, but doing it in bulk and doing it fast is. When I started trying to implement bulk search for Domain Pigeon, I couldn’t figure out a way to do it well. I decided to pivot slightly and simply listed available web 2.0-style domain names instead. Domain Pigeon did well, but I made a bunch of mistakes which eventually led to its downfall. I remember thinking foolishly “Man, making money with web apps is easy.” Domain Pigeon was never supposed to take off. It was a something I undertook to learn web development; it wasn’t supposed to be what I became known for. Yet I’d go to Philly on Rails meetups and I’d be the “Domain Pigeon guy”. And so I started working on other projects, one of which eventually became Preceden. I kept working on Domain Pigeon on the side, but as I became more and more involved in Preceden’s development, I let Domain Pigeon slide and eventually just said screw it and shut it down. 1) It’s hard to make money with web apps. If you are lucky enough or talented enough to find something that people like and will pay for, double down. 2) If you do decide to work on new projects, don’t abandon your existing ones. If you don’t have the discipline to maintain existing projects while building new ones, then don’t build new ones until you do. I launched Preceden and eventually Lean Designs, but I still had the domain name itch. I really wanted to build that original search tool and continued brainstorming ways to do it. About five months ago I decided to take a break from Preceden and Lean Designs development and go for it (without abandoning either — see #2 above). Lean Domain Search is the result. It’s better that what I originally envisioned: it generates and checks the availability of 1,000 domain names in about 2 to 3 seconds (go check it out!). The launch on HackerNews went well, but it was not without issues (launch day never is). The biggest problem was the accuracy of the results. I estimated beforehand that about 1 in 1000 available results would be actually be registered due to some quirks with the way they were being checked. That turned out to be a tad bit optimistic: it was more like 1 in 20. As an extreme example, the results for “cloud” returned 10 results, none of which were actually available. This was understandably frustrating to anyone who searched for “cloud”, found domain names that he or she got excited enough to register, and then found out it was actually registered. There was a hectic hour of hacking after that where I troubleshot and fixed the double-check feature, but it still felt sloppy. Everyone searching for “cloud” still got those same 10 incorrect results. Eventually it clicked: why not track the double-check results and stop showing ones that come back registered? After another few hours of hacking, I had a decent solution in place: if you double-checked the result of an available domain name and it came back as registered, Lean Domain Search would remember that and it would no longer be shown in the available search results for you or anyone else. This way the results become more and more accurate as more people use it. 1 in 1000 might never be possible, but the false positive rate should eventually be closer to 1 in 100 than 1 in 20 (and thanks to Mixpanel, I can actually track that over time). This morning I spent a few hours cleaning up the code and making other improvements. For example, when you click a domain name it will now automatically double check the result so you don’t have to. I also found a typo today in the Namecheap affiliate link that caused my affiliate code to be dropped so I didn’t get credit for who knows how many domain name registrations yesterday. Fun! But it was still a good day. All in all folks used Lean Domain Search to make about 14,000 searches yesterday thanks to it sitting on the HackerNews front page for almost 20 hours. Launch day traffic is always inflated though (don’t be fooled! ); the trick is getting it back up to that point over the next few months. The mentions on Twitter about Lean Domain Search were very positive too — thank you to everyone who Tweeted about it. On a final note, I should be blogging a lot more in the future. If you’re not subscribed to the RSS feed, you should. It gives me great pleasure to announce that you can now create hybrid width layouts using Lean Designs, letting you create professional looking websites in a fraction of the time compared to doing it by hand. In a fixed width layout, the site is given a fixed, constant width which is then displayed (usually centered) in the browser. With this type of layout, you cannot use any of the excess space in the browser except for specifying the page’s background style (white in the example below). Until today, fixed width layouts were the only type of design you could create with Lean Designs. 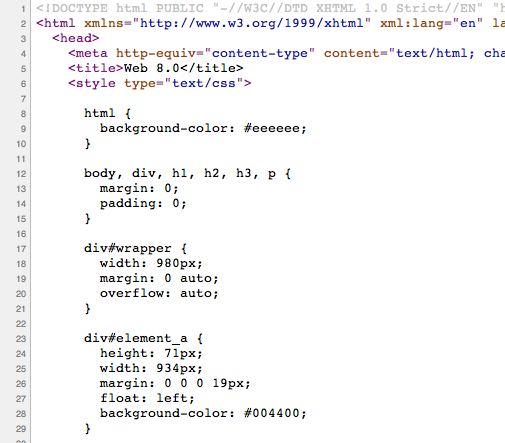 In a 100% width/fluid width/liquid width layout, the width of the site is based on the width of the browser. Because the position of the the elements are based on the width of the page, they’ll appear differently to visitors depending on the width of their browser. Fluid widths are not currently supported by Lean Designs. Hybrid width layouts, as the name implies, takes pieces of both the fixed width and the 100% width layouts. With this type of layout the outer elements can have 100% widths, but their contents are held in a fixed width, centered container. With today’s release, you can now create this type of design using Lean Designs. Note that the term hybrid width is not a standard web design term, but we needed a way to differentiate this type of layout from the fixed width and 100% width layouts. When you export it, Lean Designs will recognize that you want this element to have a 100% width and generate the appropriate HTML/CSS. Hope you like it. If you don’t have an account, you can sign up for free and create your own design in minutes. As always, drop us a note if you run into any bugs or have ideas for improvement. About a month ago I changed jMockups’s name to Lean Designs. The primary reason for the change was a shift in focus away from creating website mockups towards actually creating websites, as that’s what most users wanted. It has taken a while, but today I launched a version of Lean Designs that lets you do just that. You can read more about it here. And check out the demo here. Next to the initial launch in October, today’s release represents the largest milestone in the project’s nearly one year history. I’m incredibly excited about its potential to disrupt the web design industry. Don’t get me wrong: it’s got a long way to go. There’s a thousand ways it can be approve improved, but the fundamentals are in place. Now its all about pressure and time.